What is the Papa Joe Ride? After Papa Joe Lefebvre lost his battle with cancer in 1993, eight of his buddies got together a year later and rode their bikes in his memory. With this simple gesture, they began what would be the largest organized motorcycle ride in North-eastern Ontario. Since 2000, the Ride has raised over $200,000 toward the new hospital's chemo unit as well as for needed medical equipment such as a chemo hood, a colonoscope and a tympanic thermometer. The waiting area in the Cancer/Chemo unit of the new hospital will be dedicated to Papa Joe. Proceeds of this year's ride will be going to the North Bay and District Hospital Foundation for cancer care. The Papa Joe Ride again for 2009 was a complete success raising thousands of dollars and giving riders an excellent time. Hats off to the Lefebvre and Parise families for their dedication, enthusiasm and hard work to keep this event running and for raising the monies for Cancer equipment so desperately needed. 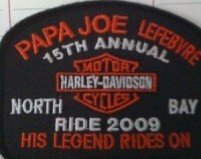 Here's a quick video clip of the staging area for the Papa Joe Ride in North Bay Ontario for 2009. The weather was perfect, the food was awesome and the friends incredible. Great time had by all who attended.